Unfortunately, only one of these things lends itself to guiding us when choosing a Malt of the Month, and upsettingly it’s not my birthday. 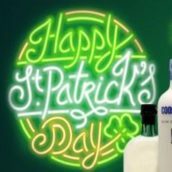 Instead, we’ve gone for an Irish whiskey, ready to celebrate St Patrick on 17 March. We’ve chosen Bushmills 1608, originally a special edition produced to celebrate a 400th anniversary, but kept on due to popularity as a regular part of their range. As we’ve mentioned before, 1608 isn’t the date of Bushmills’ own founding, instead being when the first distilling licence was issued in the area. 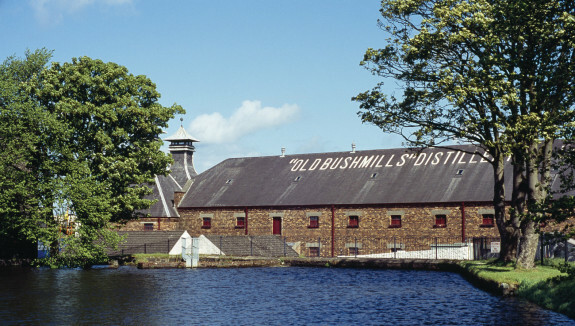 Bushmills itself looks to have appeared in 1784, but that still isn’t the current distillery, as the original burned down in 1885 and was then rebuilt. 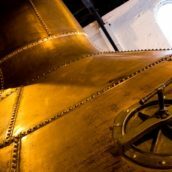 In short: the distillery has some history, but maybe not as much as the numbers on the bottle might have you believe. 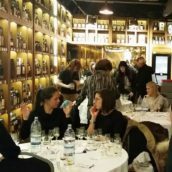 No matter how old it is – and even 130 years isn’t to be sniffed at – Bushmills focuses on a different style to the rest of Ireland: single malt. 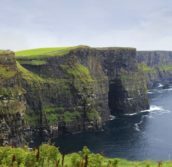 While malt taxes in the 1850s pushed other distillers to develop the pot still style that Ireland is increasingly well-known for, Bushmills stayed with malt whiskey, distinguishing themselves from the rest of the country. 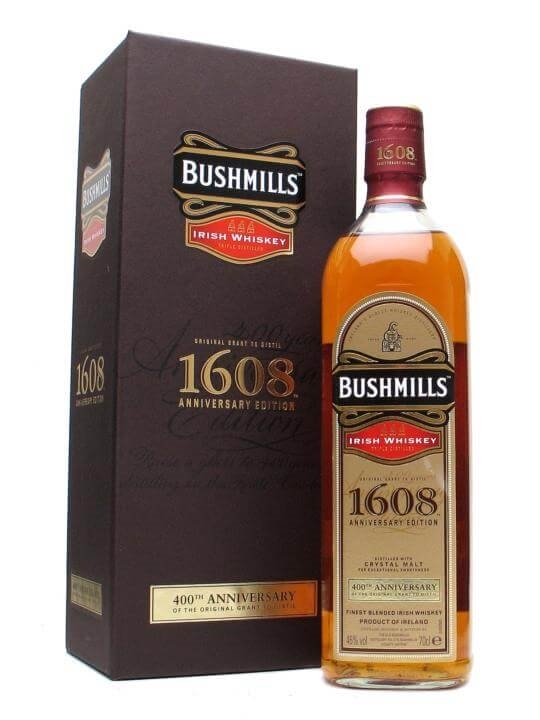 Bushmills 1608 takes the distillery’s knowledge of single malt, tweaks things a bit and adds in some Irish grain whiskey. It’s a malt-led blend, and the tweaked element is a component made using crystal malt – a style of malt which imparts a sweet and caramel-heavy flavour to beers along with deeper colour. I’m not sure what the crystal malt adds to the whiskey, as the extra sugar and colour won’t make it through the distillation process, but the whiskey is certainly different from the other Bushmills blends. Nose: Maraschino cherries, oily touches, sponge cake, apples and nuttiness. Body: Tannic and rich, with vanilla toffee, apple skin, lemon peel and layers of sweet orchard fruit: spiced apple and pear pie. Finish: Soft and spicy, with lingering cinnamon notes. Comment: A great blended whiskey, with some of the traditionally fruity Irish whiskey notes balanced by spiciness and a richer, malt-whisky body. 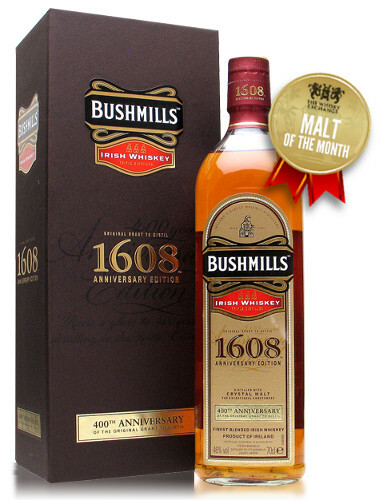 Throughout March 2015, we’re doing a special offer on Bushmills 1608, with £8 off all month. With St Patrick’s Day only a couple of weeks off, it’s a great celebratory dram. A special bottling to commemorate the 400th anniversary of the license to distil aqua vitae in Antrim originally granted in 1608 to Sir Thomas Phillips. Bushmills 1608 was named Best Irish Blended Whiskey (No Age Statement) at the World Whiskies Awards twice, most recently in 2012.